As an RNA virus, it is considered that PRRS virus is a fairly labile virus in the environment. It is important to note that it is quickly inactivated by heat and drying. These facts should be taken account in the control of the disease and when samples are stored or sent to the lab. 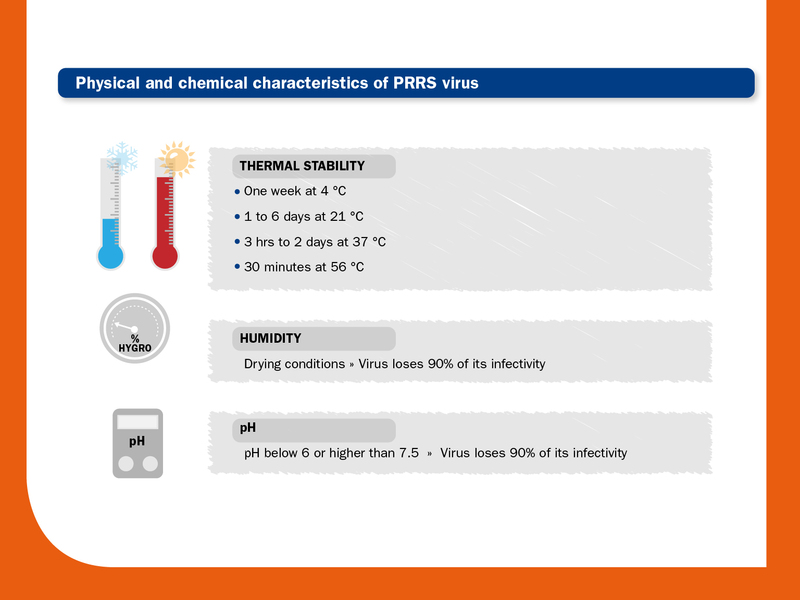 PRRS virus is easily inactivated by phenol, formaldehyde and most common detergents and disinfectants. Also, it is very sensitive to pH values lower than 6 or higher than 7.5. Therefore, routine clean-up and disinfection procedures (and drying) can inactivate it. Complete inactivation is achieved with iodine (0.0075%; 1 minute), quaternary ammonium compound (0.0063%; 1 minute) or chlorine (0.03%, 10 minutes). Also, 10 minutes of UV light completely inactivate the virus on farm surfaces and materials.